MIAMI — Francis Suarez comes from a long line of civic and political leaders who have formed the Republican bedrock in south Florida’s Cuban community for a half-century. Yet the 38-year-old Miami city commissioner hasn’t decided whether he will vote for his party’s presidential nominee. And he’s not alone. Many Cuban-Americans express solidarity with other Latin-Americans who see Donald Trump as anti-Hispanic. Still others hear in Trump’s nationalistic populism echoes of the government strongmen they once fled. How those misgivings influence the votes of hundreds of thousands of Cuban-Americans could tilt the nation’s most populous presidential battleground state and, depending on circumstances elsewhere, determine whether Trump or Democrat Hillary Clinton wins the election. Roberto Rodriguez Tejera, a well-known Spanish-language radio and television host in Miami, says he won’t endorse Trump or Clinton, arguing neither has engaged in genuine, personal outreach to average Cuban and other Hispanic voters. But Tejera asks his audiences to compare Trump’s assertions that “I am your voice” and “I alone can solve” societal ills to the initial appeals of authoritarian rulers like Cuba’s Fidel Castro and the late Hugo Chavez in Venezuela. Fernand Amandi, a Democratic south Florida pollster, estimates the Cuban-American vote could approach 8 percent of the 8 million-plus ballots cast in Florida in November. Amandi said Cuban-Americans are “the only Hispanic group in the country” to support Trump over Clinton in preference polling, but not by a margin victorious Republican nominees have managed. Suarez, the Miami commissioner, applauds that approach, but he says it doesn’t account for some Cubans-Americans who are thinking of themselves, for the first time in presidential politics, as aligned with immigrants from Mexico and the nations of Central and South America — a collective class of people who have never enjoyed Cubans’ favored immigration status. “Some Cubans don’t consider themselves Hispanic,” says Amandi, the Democratic pollster. 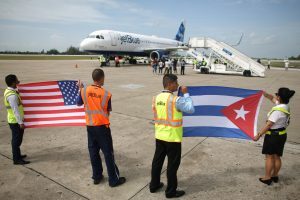 But now, says Republican pollster Dario Moreno, Trump has made immigration a “symbolic issue” that penetrates the Cuban psyche. “Anti-immigration rhetoric is taken as anti-Hispanic,” Moreno said, “and you see that even among the old Cubans” who were the first to arrive in Florida as refugees after Castro came to power in 1959. One of the GOP’s top financiers, health-care billionaire Mike Fernandez, recently called Trump an “abysmally unfit candidate” and endorsed Clinton. Other prominent Republicans — Miami Mayor Tomas Regalado and U.S. Reps. Carlos Curbelo and Ileana Ros-Lehtinen — have said they will not support Trump, though they’ve stopped short of endorsing Clinton. Tejera, the broadcaster, says heavyweights like Gutierrez and Fernandez “won’t move one vote,” but their public backing of a Democratic nominee is a striking development in Cuban-American politics. “We’re starting to see them think and vote like everybody else, not be driven by a single issue,” says Moreno, the Republican pollster and a professor at Miami’s Florida International University. Exit polls in the 2012 election found Cuban-Americans essentially split between President Barack Obama and Republican Mitt Romney, less than a decade after George W. Bush won the Cuban vote overwhelmingly. Obama has since normalized diplomatic relations with Havana, traveled to the island for a state visit and called on Congress to lift the trade embargo. Clinton has forcefully ratified Obama’s stance. Until last week, Trump effectively endorsed it, as well, with vague qualifiers that he’d get “a better deal” than Obama. Yet on Friday in Miami, he reversed himself, embracing the hard-liners’ longstanding views and promising to roll back Obama’s actions unless the Castro government expanded political freedoms on the island. To be clear, Clinton doesn’t have a lock on Cuban-American votes Trump may lose. Amandi notes that Clinton’s Spanish-language media presence began months later than Obama’s general election efforts. Tejera dismissed Clinton’s south Florida outreach as “meeting with the usual Democratic officials and donors” and perhaps the highest-profile Republicans who can’t abide Trump. Then there’s Florida Sen. Marco Rubio’s re-election campaign. Moreno described Rubio, the son of Cuban refugees, as a “role model in the Cuban-American community the way Barack Obama is in the African-American community.” Rubio trounced Trump in Miami-Dade County in the March presidential primary, despite Trump’s easy statewide win. Back at Miami City Hall, Suarez says that’s possible, but he argued Cuban-American Republicans are just as likely to see Rubio as an easy out: They can abandon Trump and still call themselves party loyalists, like always.